TBT: If you can’t drink coffee…try Barley coffee! Yes, I realize it’s Friday and I am one day behind on my throw-back. I’m sorry. Anyways, today’s post was published here in 2013 after I presented at the Greenville Interstitial Cystitis Support Group. I always love working with local support groups, and I am excited to be presenting to and learning with the Atlanta Area Interstitial Cystitis Support Group next month! I had such a wonderful time with those ladies and I was introduced for the first time to Barley coffee–yes, you heard me right–coffee made from Barley. For many people with bladder problems including Overactive Bladder, Interstitial Cystitis/Painful Bladder Syndrome, and Urinary Incontinence, regular coffee is not tolerated well and can exacerbate symptoms. Barley coffee is a great alternative that packs a great taste (I was skeptical too, but it’s true!) but doesn’t have the acid and caffeine which irritate. Check out my post, and give it a try! In April 2014, I was fortunate enough to meet with a lovely group of ladies at their support group for people who have been diagnosed with Interstitial Cystitis/Bladder Pain Syndrome. (For those of you who are not familiar with this condition, you can read about it here) This is a fantastic group started by Martha Fowler, RN back in 2010. Since then, I can tell you that Martha has been an amazing support for several of my patients! So many times, people feel alone when struggling with pelvic pain conditions, and it’s nice to talk with others who understand first hand what you are going through. For those of you reading this who live in other areas (such as Atlanta, like me!) there are tons of other support groups out there for people with IC/PBS. The Interstitial Cystitis Association (ICA) has a great list here. Anyways, before we got started, Martha introduced us to Barley coffee—I know what you’re thinking—weird, nasty, gross—but I was shocked that I actually enjoyed this concoction! When I first tasted it, I will admit, I poured myself approximately ¼ cup (assuming I would hate it), but I quickly went back, filled it all the way up and drank the entire thing! SERIOUSLY! I actually think I may keep this on hand to drink on a regular basis. I have long wanted to cut back on my caffeine intake, and really, this may be the ticket! Why the need for Barley Coffee? For people with Interstitial Cystitis (and other bladder/bowel problems), coffee can be quite irritating to the bladder. Coffee is a double-whammy of irritation—not only does it have caffeine, but it is also highly acidic. Mix this together, and you get a very unhappy bladder—and if you have IC/PBS, that equals pain and strong urges to urinate. Barley is a grain and a member of the grass-family. You may recognize it from being used as animal food as well as in beer, bread, soups and stews. The Whole Grain Council (yes, it exists) has listed several health benefits of eating barley including lowering blood sugar, decreasing cholesterol, and possibly with weight loss. And what about drinking it? Well, I will admit it’s not quite the same since you are not actually consuming the grain—but, it seems like a good option for your bladder! And it tastes pretty darn good. 2. Allow to cool completely. Store in airtight container until ready to use. 3. 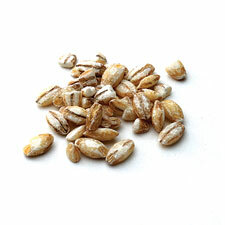 Add a few tablespoons of roasted barley to a pot of water and heat over medium. The longer you heat the water/barley the “darker” your coffee. 4. Strain out barley & save for later use! Serve in your best coffee pot with cream/milk & sugar. I hope you enjoy this wonderful coffee substitute! What other substitutes have you used for dietary intolerances? This entry was posted in Interstitial Cystitis and tagged Interstitial Cystitis, Overactive Bladder. Bookmark the permalink.